This beautiful, comfortable and spacious home is nicely furnished and well equipped, perfect for a large family. 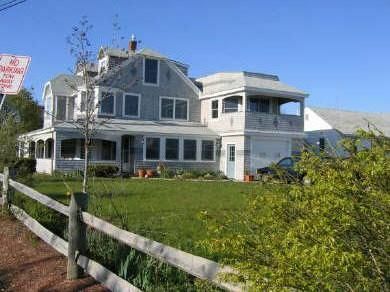 Located across the street from a public beach (inner harbor), 100 yards from Hyannis Marina, and walking distance to Nantucket and Martha's Vineyard ferries and quaint downtown, Main Street, Hyannis. Completely renovated 3 story home. Kitchen with high end appliances and pantry, family room with bar area and large flat screen TV, dining room and living room. Home has 6 bedrooms, 4 complete baths, and second floor laundry. High speed internet available if work is necessary! Linens are not included. No pets and no smoking. All bathrooms are recently renovated. 3rd floor bathroom has antique claw foot tub, no shower. The lawn has table and chairs and a large picnic table for outdoor dining. Patio on first floor has water views with table and chairs and rocking chairs for relaxing. Was plenty of room for 10 of us (7 adults and 3 kids) for the week and worked out great. Super location as there is a small public beach two blocks away and it was very convenient to Hyannis and the ferries to Nantucket and Martha's Vineyard (walking distance). Every thing was clean and easy to use with a nice porch. There is no A/C which was fine for me however a couple of my siblings were uncomfortable one or two nights (they are used to having A/C all the time) however there were plenty of fans and usually a nice sea breeze (I was perfectly fine). So I highly recommend it and the owner is very nice and easy to work with. Located in Hyannis Park, a quiet neighborhood that is only a mile walk to Main Street Hyannis, a quaint old main street with shops, restaurants, weekly summer festivals. Ocean Street, a 1/4 mile from house, has ferry service to Nantucket and Martha's Vineyard, fishing boats, sight seeing boats. Hyannis Marina is only 100 yds away.